HBO BOXING AFTER DARK presents a must-see tripleheader featuring the four top-ranked super flyweights in the world when HBO BOXING AFTER DARK: SRISAKET SOR RUNGVISAI VS. ROMAN “CHOCOLATITO” GONZALEZ AND NAOYA INOUE VS. ANTONIO NIEVES AND CARLOS CUADRAS VS. JUAN FRANCISCO ESTRADA is seen SATURDAY, SEPT. 9 at 10:15 p.m. (ET/PT) from StubHub Center in Carson, Cal. The HBO Sports team will call all the action, which will be available in HDTV, closed-captioned for the hearing-impaired and presented in Spanish on HBO Latino. 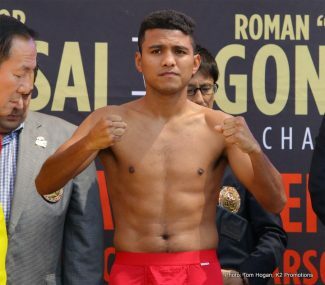 The main event features the sport’s most anticipated rematch when Thailand’s Srisaket Sor Rungvisai (43-4-1, 39 KOs) defends his super flyweight title against Nicaragua’s Roman “Chocolatito” Gonzalez (46-1, 38 KOs) in a scheduled 12-round bout. The two 30-year-old ring warriors are set to wage war again just six months after their thrilling back-and-forth fight at Madison Square Garden, which resulted in the title changing hands and Gonzalez losing his undefeated record via a controversial majority decision. 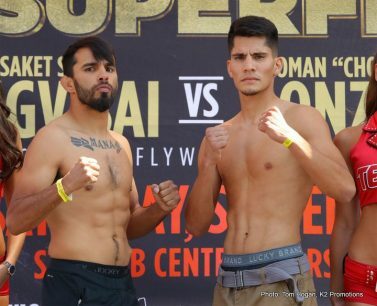 Sor Rungvisai used his unconventional southpaw style to capture his first world title and now hopes to defend it successfully in just his second U.S. fight, while former four-division champion Gonzalez seeks to avenge his first pro defeat in his sixth HBO appearance. 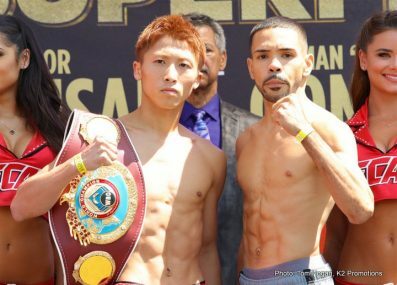 In the co-main event, Naoya Inoue (13-0, 11 KOs) of Yokohama, Japan, defends his share of the super flyweight title against Cleveland’s Antonio Nieves (17-1-2, 9 KOs) in scheduled 12-round bout. Inoue, 24, makes his U.S. debut following a fast start to his pro career, having captured a world title in just his sixth professional fight and successfully defended his super flyweight title five times. Nieves, 30, is making his first bid for a world title and looks to disrupt Inoue’s campaign in the 115-pound division. 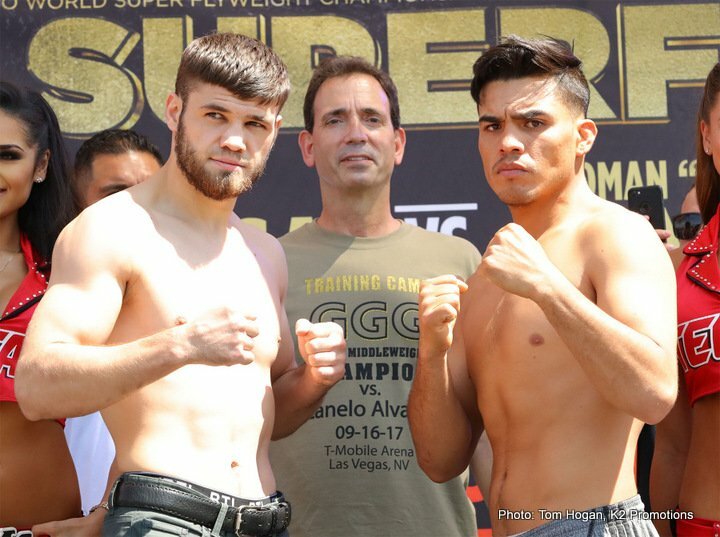 In the opening bout, former world champions from Mexico square off when Carlos Cuadras (36-1-1, 27 KOs) of Mexico City takes on Juan Francisco Estrada (35-2, 25 KOs) of Sonora in a scheduled 12-round super flyweight contest. Cuadras, 28, and Estrada, 27, have both lost to Roman “Chocolatito” Gonzalez, and are seeking a shot at a piece of the super flyweight title. The executive producer of HBO BOXING AFTER DARK is Rick Bernstein; producer, Thomas Odelfelt; director, Johnathan Evans.